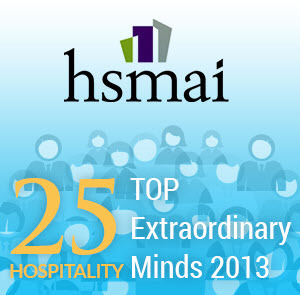 Santa Clara, CA - January 28th 2014 - Milestone Internet Marketing, Inc. announced today that its Founder, Benu Aggarwal, was honored by The Hospitality Sales & Marketing Association International (HSMAI), naming her one of the Top 25 Extraordinary Minds in Hospitality Sales and Marketing for 2013. Milestone is a leader in digital marketing and social media software and services for the hospitality industry. This is Milestone's second year in a row achieving the "Top 25" distinction with last year's honor going to Milestone's CEO, Anil Aggarwal. The 11th annual "Top 25" award recognizes the best of the best in the hospitality and tourism industries. Award recipients were judged by a panel of senior industry executives for their work based on the following criteria: creativity and innovation; cutting edge sales or marketing campaigns; triumph in challenging situations; and sales efforts that resulted in dramatic gains. "The 'Top 25' is our annual hot list that celebrates the sales, marketing and revenue management leaders and innovators in our industry," said Robert A. Gilbert, CHME, CHBA, President and CEO of HSMAI. "The creative strategies, passionate dedication, and sharp intelligence of these professionals have not only grown the business within their organizations but have also truly raised the bar for the hospitality industry as a whole." "It is truly an honor to receive this award," said Milestone's Founder, Benu Aggarwal. "I want to accept this recognition on behalf of Milestone's extraordinary team, our customers, and our partners. Their hard work, dedication, and partnership enables Milestone to develop and implement innovative search marketing and social media solutions that drive consistently high revenue for our customers. I am so proud and grateful to have an amazing team behind me to support Milestone's mission," she said. "It is inspiring to be recognized by a prestigious organization like HSMAI, which awarded me my very first CHME certification in 1998," she added. Benu Aggarwal is also well known expert in search and digital marketing strategies for hospitality industry. She has authored a book for hotels on digital marketing and is a well recognized speaker at Search Engine and hospitality conferences such as SES, SMX, HITEC, etc. Mrs. Aggarwal will be honored during a private ceremony preceding the Adrian Awards Gala on February, 2014, at the New York Marriott Marquis and will be recognized at the Adrian Awards dinner reception and gala. Milestone Internet Marketing, Inc. is a leading provider of Internet marketing solutions for the lodging industry. Milestone's portfolio of services includes Hotel Website Design, Search Engine Optimization, Pay-per-Click marketing, Social Media Optimization, MediaConnect360™ a social media management tool, and eBuzz Connect™ an online reputation monitoring software. Milestone currently works with over 1,500 hotels and drives over $550M in annual revenue for its clients. Milestone is a preferred vendor for several major lodging industry brands and works with some of the leading hotel management companies. Milestone is also well known as a lodging industry educator for its Hotels to HTMLs Internet marketing workshops and book. For more information, please visit www.milestoneinternet.com, email [email protected], or call 888-350-8396.